Apparently, 61% of the most effective marketers are meeting with their content teams regularly. But imagine if other teams in the company were involved in content? How could that increase effectiveness? 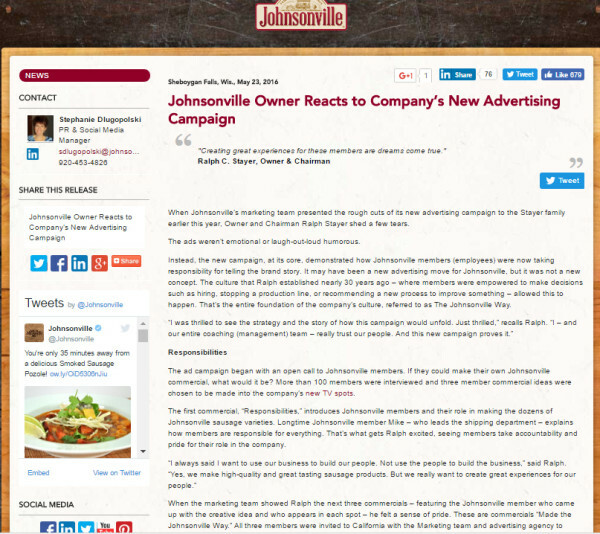 One of the most inspiring examples of a company using the creative power of employees outside of the content team is Johnsonville, the Wisconsin-based sausage maker. The company asked its employees to help tell the brand story, and more than 100 employees responded to an open call. One of the results: Several awesome commercials were created, such as “Regular Speed Chase” by Brett and “Jeff and His Forest Friends” by Jeff. Each spot is still making waves on social media. The company also shared the process, its executives’ reaction, and more through its blog. Just think of the creativity, fresh perspectives, and advocates you could have if everyone in your company were an unofficial member of your content marketing team. Here are six ways to get started. Make sure company executives are on board with the idea of involving more employees and are willing to promote your plan with department leaders as you test different solutions. Every department of your company needs to realize benefits of #content collaboration says @danlsteiner.CLICK TO TWEETTalk to department leaders separately to determine how much time they can allocate for their team members to participate in content creation on a monthly basis. Discuss the possibilities of rewarding employees’ contribution and enthusiasm for content marketing efforts through bonuses, exclusive event passes, free trips, internal recognition, etc. If members of other teams, such as sales or customer support, have ideas and would like to make something of them, give them the opportunity. Ask if they have anything they are interested in making for the brand. Consider giving them the chance to write something for the blog under their name or even to record a video. Promote the opportunity in the company-wide newsletter by inviting employees to participate in corporate content creation. Include a survey to better understand company employees’ hobbies, interests, angles they may be interested in covering. Introduce internal communication tools that make it easier to get more employees on board. One of the most inspiring examples of big companies encouraging content collaboration is the IBM Redbooks thought-leadership program. IBM invites its employees to contribute to the site and offers blogging training for employees. The efforts resulted in over 2,000 blog posts from over 500 employee thought leaders who regularly contribute to company properties. Not all employees want to create something, and that’s OK. Your whole company collaborative process can involve non-creators, too. They can provide ideas in an informal way. While brainstorming is one option, I am not a big fan of brainstorming at formal meetings. In my experience, most people shy away from contributing ideas in a group environment. They prefer to share ideas through other mechanisms after they have time to think. It can be more convenient, time-saving and scalable to introduce a separate tool where employees can submit their ideas. Open a discussion channel in Slack, make a Trello board, or share a Google Doc. Then ask employees to add their ideas. 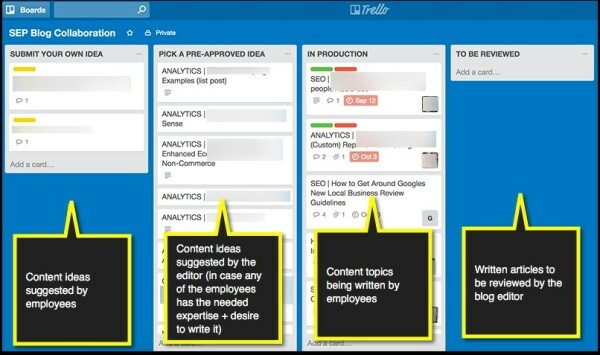 Below is an example of a Trello board letting various team members brainstorm, share, and discuss content ideas. Many employees are already on social media, and some regularly follow and engage in online conversations. By encouraging them to share the brand story and messages, you boost your social media presence and loyalty. Consider just a few of these stats and experiences. As SocialChorus co-founder and SVP of Strategy Nicole Alvino told SocialMediaToday, content shared by employees receives around eight times more engagement than content shared by brand channels.
.@EdelmanPR says #content shared by employees receives 8x more engagement via @nalvino @socialmedia2day.CLICK TO TWEETMSLGROUP reports that brand messages extend 561% further when shared by employees versus the same messages shared via official brand social channels. Brand messages extend 561% further when shared by employees vs brand social channels by @msl_group.CLICK TO TWEETThe content marketing and social media management tool, DrumUp, offers an employee-advocacy feature to help organize collaborative social media sharing of corporate content. 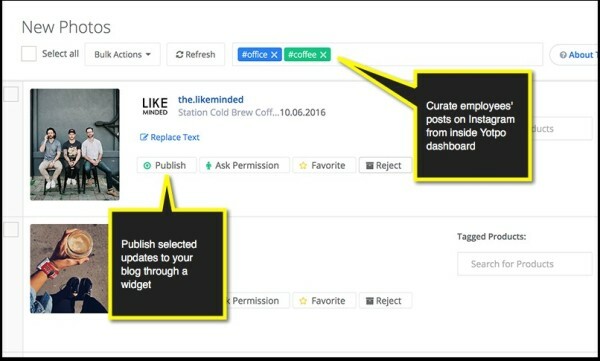 It gives your employees one place to access all content and easily post it (or schedule it for posting) to their social media channels. You’ll be able to identify those who are most enthusiastic about sharing and recognize their effort through a public announcement and/or some sort of tangible prizes or rewards. You may even come up with monthly contests to encourage more participation. Introducing social media policies and guidelines lets your employees know what they can reveal on social media and how much time they can spend there. Associated Press social media policies are a good example of minimal precautions you may want to introduce. Holding social media training sessions lets you explain basic concepts (hashtags, tagging, etc.). Intel introduced its Digital IQ training program in 2008, offering employees free and flexible certification options based on their roles and growth plans. The combination of training and policies provides a framework for employees to increase their participation in social media. 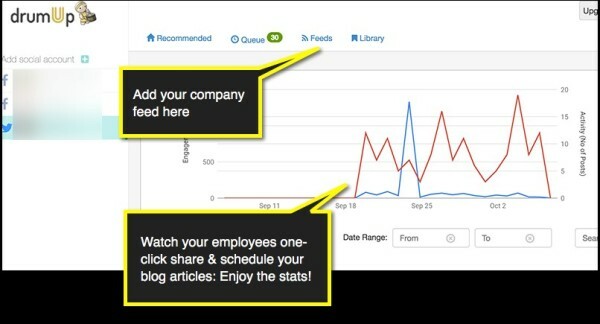 Getting your employees to share your content is a great way to get your word spread further. But there’s another opportunity as well: Curate your employees’ best social media content to feature it on your brand’s site. By doing this, you’ll encourage your employees to share more, show off your brand personality, and thus give your potential customers a glimpse inside your team (and grow trust in your brand), and attract talent to your company, as well. 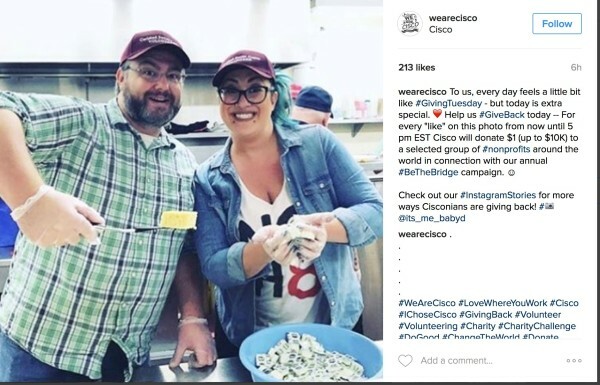 For inspiration, look at how Cisco built a powerful Instagram account by asking the whole company to contribute using the #WeAreCisco hashtag. The best images make it to Cisco’s company account, and the featured employee is always tagged. Cisco hosted week-long training sessions explaining how Instagram works and how to use the corporate hashtag to become part of the effort. Yotpo, a platform to create and curate online reviews, is a good tool for collecting and publicizing employees’ updates to your site. The Instagram curation feature lets you easily locate relevant Instagram updates and publish them to your blog with one click of a button. Sometimes it is just a matter of talking to each other. Some brand content marketing teams interview non-content employees about what they do and what they think about their area of expertise. For instance, you might ask employees to participate in Twitter chats. You may be surprised by how popular something as simple as a transcript from one of these chats can be, and how good your team will feel having their comments highlighted within it. You can take their input in other directions too, such as podcasts and videos. These steps and others get them directly conversing with customers and members of the online community, and that is a truly great part of providing valuable content in the future. For an instance, Brafton, a marketing agency, has a cool tradition of featuring new and old employees in regular blog spotlights. 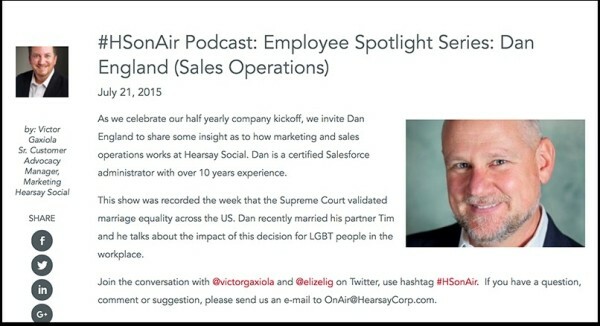 Another interesting example is Hear Say Social’s podcasts with their team members who also are featured on the blog. Apart from valuable content assets, these efforts also improve the reputation of your brand so you can, again, attract more valuable individuals to join your company. You can’t run a ship on your own; you need a crew. But with only the content team aboard, you can’t go as quickly and effectively as you might with others lending a hand. Putting your brand’s entire team — no matter the department — onto the task of helping with content can make a big difference. It might even end up launching creative avenues you never expected. After all, would Johnsonville’s creative team ever have thought about a speed chase with the world’s largest grill or animals talking in the forest without Brett or Jeff? How do you get your team involved in content planning or creation? Do you have a story of how it worked for your brand? Let us know in the comments. Want to help team members learn more about content marketing, best practices, etc.? Register them for Content Marketing University. Winter enrollment ends Dec. 31. Why Most Online Marketing Fails & Why You Should Trust Me To Handle It For You. I am not positive the place you are getting your info, however good topic. I must spend some time studying more or working out more. Thank you for magnificent info I used to be on the lookout for this information for my mission. I write most of my posts myself. There is a lot running around inside my head so when I think of something good I write.
) I handle such info much. I was seeking this certain information for a long time.